The art of sampling is the most tangible form of borrowing from the music of the past to create the sound of today. Whether these samples are used in tribute to the original music or in an attempt to create an entirely new form, sampling is a large part of the urban contemporary creative process. Borrowing elements from the work of others is arguably a necessary step in all creative process. When we discuss the origin of the elements of a piece of work, we can better understand the technological and cultural context in which ideas resurface. Samples Interlude: DJ Greg Caz's exploration into classic Hip Hop tracks and the original undercover Jazz and R&B songs that made these songs great. 8pm and throughout the evening. 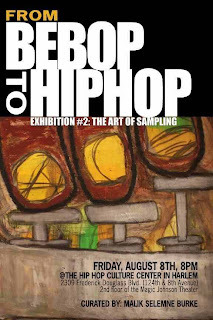 Panel discussion: The art of sampling: 9pm – 10pm. Performance: The Crowd, featuring Adeline, Akil Dasan, and Randy Mason 10pm. The WeBop Session, featuring Dionysos and the Proximity Effect. Many secret special guests!